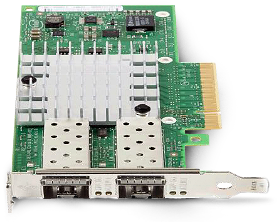 A Linux machine -or virtual machine-, can require having multiple ethernet cards, each on a separate LAN. One reason for this can be to separate network traffic; for example, all management traffic can be routed to one NIC, while the another NIC handles all other traffic. With one single NIC, the default Linux installation will automatically set it up as a static or dynamic IP address, and a default gateway. When there are multiple NICs, gateway routing becomes an issue. Basically, there is initially only one default gateway, associated to one of the NICs, and all outgoing traffic will be sent on that default gateway / NIC. If there is incoming traffic on the other NIC, the answer is not sent back via the same route, being then effectively lost. This page explains correctly the problem happening when using multiple NICs. up ip route add default via 172.30.250.254 dev eth0 table eth0 Here, the default gateway (172.30.250.254) is specified. Finally, it is important to note that in this file, only eth1 defines a gateway. eth0 does not have one defined. That is: not controlled by network manager, using DHCP, and defining a default route.